Tomorrow, 12 July 2016, the trial of the prominent human rights defender Nabeel Rajab begins. Facing charges related to comments on the social media website Twitter, Rajab may be sentenced to more than ten years in prison. We, the undersigned NGOs, hold the government of Bahrain responsible for the deterioration of Rajab’s health due to poor detention conditions. We call on the Bahraini authorities to immediately and unconditionally release Rajab, and to drop all charges against him. 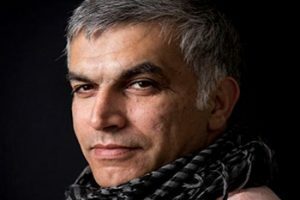 Rajab is a leading Bahraini human rights defender, well known in the region – and worldwide – for his defense of human rights, and his efforts towards more freedom for all. As a result of his work he has been repeatedly jailed. He is the President of the Bahrain Center for Human Rights (BCHR), Founding Director of the regional Gulf Center for Human Rights (GCHR), Deputy Secretary General of the International Federation for Human Rights (FIDH) and is also on the Advisory Committee of Human Rights Watch’s Middle East Division. On 13 June 2016, in the early hours of the morning, Rajab was arrested without any declared reason. He was not informed of his charges until the following day, when he was brought before the public prosecution and officially charged with “spreading false news and rumors about the internal situation in a bid to discredit Bahrain.” He was then remanded to seven days in custody pending investigation. This charge was in response to statements he gave during past television interviews in early 2015 and 2016. On 28 June 2016, Rajab was transferred to the Bahrain Defense Hospital’s Coronary Care Unit for an irregular heartbeat. His family was informed that he is also suffering from high blood pressure, a condition for which he was treated two years ago. Despite his weak condition, he was hastily transported from the Coronary Unit back to jail the following day. Since the arrest, Rajab has been detained in extremely poor conditions in solitary confinement. His cell is filthy, the toilet and shower are unclean and unhygienic, and there is little or no clean water in the bathroom. These conditions have been detrimental to Rajab’s health; he has lost eight kgs in just two weeks. Blood tests have shown that he has acquired both a urinary tract infection and low mononucleosis, and he is awaiting the results of additional screenings. Rajab also needs surgery to treat gallstones and an enlarged gallbladder. He is also suffering from an enlarged prostate and needs to be seen by a hematologist. His surgeries will not be scheduled before August. On 26 June 2016, the authorities notified Rajab that his first court hearing for another case would be for 12 July 2016. This separate case is related to other tweets and retweets about Jau prison and the war in Yemen, which were posted in 2015. He may face up to 13 years in prison if found guilty, and the authorities have ordered that Rajab remain in detention until his hearing. We remind the Bahraini government of its obligation to preserve the right to free expression under article 19 of the International Covenant on Civil and Political Rights, to which Bahrain acceded in 2006. We call for action to be taken to guarantee and protect the health of human rights defender Nabeel Rajab from further deterioration. We reiterate repeated calls by United Nations officials, and others in the international community, to immediately release Rajab. For background information on Nabeel Rajab, please visit this BCHR page and for any further developments on his case this BCHR page, which is regularly updated with the latest information.